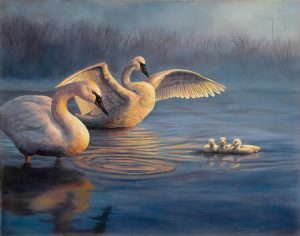 Steve Wilson’s Rocky Mountain Fine Art showcases a diverse collection of landscape and wildlife art of the Rocky Mountains and other nations and international landmarks. Painted with vibrant colors and vivid definition, each painting comes to life on the canvas, combining realism with dreamlike beauty. Each serene location brings out the inner allure of the landscape, from soft sunsets to towering mountains, autumnal trees, and sprawling forests. Steve paints stunning original pieces and also offers giclee archival pigment print reproductions in limit quantities, giving you inimitable original art at an affordable price. You can find a piece to adorn the walls of your mountain cabin, your summer getaway or bring amazing color and serenity into the favorite room of your home or business. Anywhere you hang your painting you will have a pleasant escape from the mundane and the stressful, giving you peace and tranquility whenever you need it. Take a look at the gallery of paintings to find a unique original to hang in your home or office. Also, take a look at the giclee reproductions to find many more spectacular pieces. “Steve Wilson’s landscape wall art is like a breath of peace in troubled times. Copyright 2018 – Steve Wilson – all rights reserved.